Paul Dignan has been invited to exhibit work created between 2004 to 2009 in a solo show at the Benedicta Arts Centre at Saint John's University in Minnesota. The exhibition runs from March 3 to April 8, 2011. These paintings, which differ from the work now showing at KWT Contemporary, use ambiguous imagery taken from sources such as monograms, wallpaper designs, sections of cartoons and other sampled imagery as well as self generated drawings. 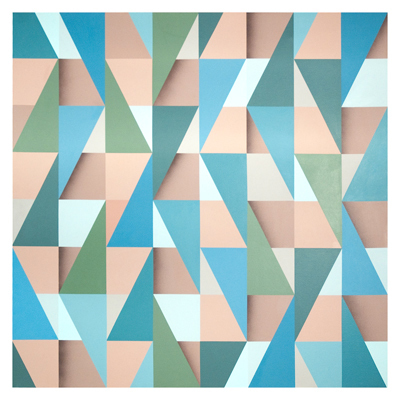 "Untitled", 2006, acrylic on canvas, 48"x48"
Paul Dignan's latest paintings (on view at KWT Contempporary through Feb. 26, 2011) can be described as neo-op, hard-edged geometric abstraction. 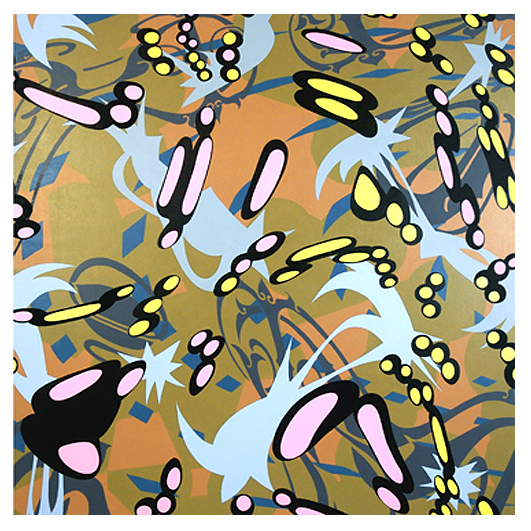 Dignan is a master of the unexpected when it comes to colour,. His work has literally been stopping traffic on Richmand St. W. for the past few weeks. The sidewalks may be slushy and the skies grey, but it is spring on the other side of our 14' main floor windows. Given that Minnesota has even harsher weather conditions than we do here in Toronto, we know that Dignan's work will be well received. "Untitled (pink)", 2010, acrylic on canvas, 54"x54"
Of his latest work, Dignan says: "I make hard edge abstract paintings that use a simple grid as a starting point. The paintings produced for this show came about through a decision to re-examine the defined, schematic striped paintings I made in the UK in the 1990’s and also in relation to the paintings I made between 2004 – 2009, after I had relocated to Canada. I wanted to reintroduce the illusion of order into this new body of work by using a rigidly defined specific structure as a starting point - usually an 8 x 8 grid. This is then deconstructed, manipulated and altered through intuitive decision-making processes whilst at the same time making reference to the original grid format.... The colour choices have been influenced by my experience of living in Canada as I have become more and more aware of the effects of the extreme shifts in Canadian weather. Objects and buildings become faded, bleached and weathered - for example, the faded orange of a rusting child's bicycle that has been left out all winter or the bleached yellowing green of a fence subjected to constant bouts of humidity and a scorching summer sun." You can see more of Dignan's work here.